Sometimes breakfast can be hard to eat if you have a sensitive gut. This chia porridge is perfect for when you need to eat something tasty and nutritious but you don’t feel like eating much. For one portion – all you need to do is soak two tablespoons of chia seeds (about 20g) in 200 ml of plant milk of your choice (I used unsweetened almond milk) and let the seeds soak for about 2 hours. So it is best if you prepare them the night before you want to eat them. During this time the tiny seeds expand and develop a slippery coating which makes them easy to eat. They slimply glide over your tongue and slip down your throat. In this recipe I have added two other ingredients; pureed strawberries and cooling mint sugar. The mint sugar is so simple to make. Just place a teaspoon or two of granulated sugar in a pestle, add 6 young, bright green, freshly picked mint leaves and bring the two together. The sugar crystals pick up the flavour of the mint and they also take on a bright green colour. The sugar can be sprinkled on the chia porridge. It tastes divine. So fresh and seasonal. There are plenty of elderflowers around at the moment which can be used to jazz up plain looking dishes and I love to strew them over anything recipes I am making with fruit. I pick young fresh flowers from the hedgerows from now and and they are around for about two weeks. Just give them a rinse and shake of any insects before you add them to any dishes you are making. In case you have missed the craze for Chia, the seeds grow on quite tall plants (1m high) in Central and Southern America. They are high in short chain omega 3 fatty acids which are converted slowly in the body to the more biologically useful long chain version and are important for keeping the nervous tissue and the retina of the eyes in good shape. The evening before you want to eat the chia porridge for breakfast, place the chia seeds in a bowl and stir in the plant milk. Whisk with a fork to ensure all the little seeds become wet. The following morning place the strawberries in a food processor and whizz until they produce a lovely purée. Set on one side. To make the mint sugar – place the granulated sugar and mint leaves in a mortar and grind with a pestle until the mint leaves have been broken down and the sugar has turned green. You should smell the fresh mint oils at this point. To assemble the chia porridge. 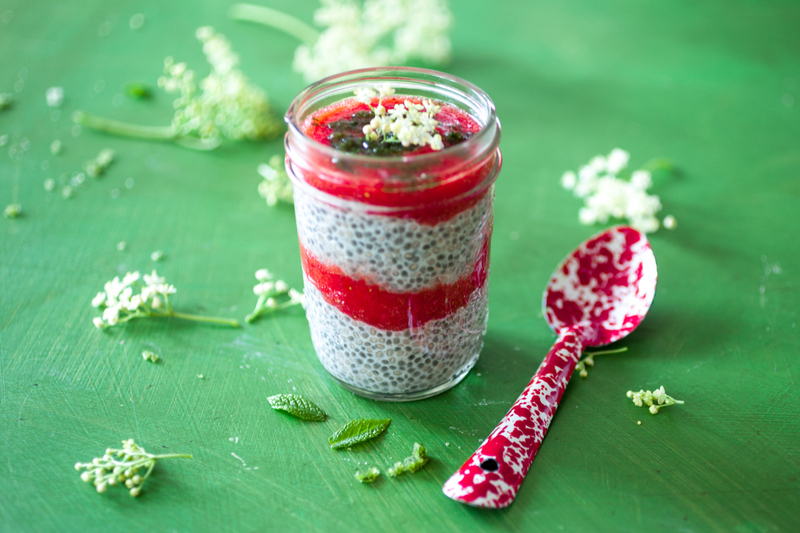 This can be done however you like but I love to layer the hydrated chia seeds between layers of strawberry purée and top with a light sprinkling of bright green sugar. 12 Jun	This entry was written by Joan Ransley and published on June 12, 2015 at 3:26 pm. It’s filed under Breakfast, Pudding, Snack and tagged almond milk, IBS, IBS Network, Irritable bowel syndrome, low FODMAP diet, LowFodMap. Bookmark the permalink. Follow any comments here with the RSS feed for this post. The recipe looks great and the photos are beautiful. Where did you get that spoon? Thank you. The spoon was a present. I am not sure where it was from. If I can find out I will let you know.